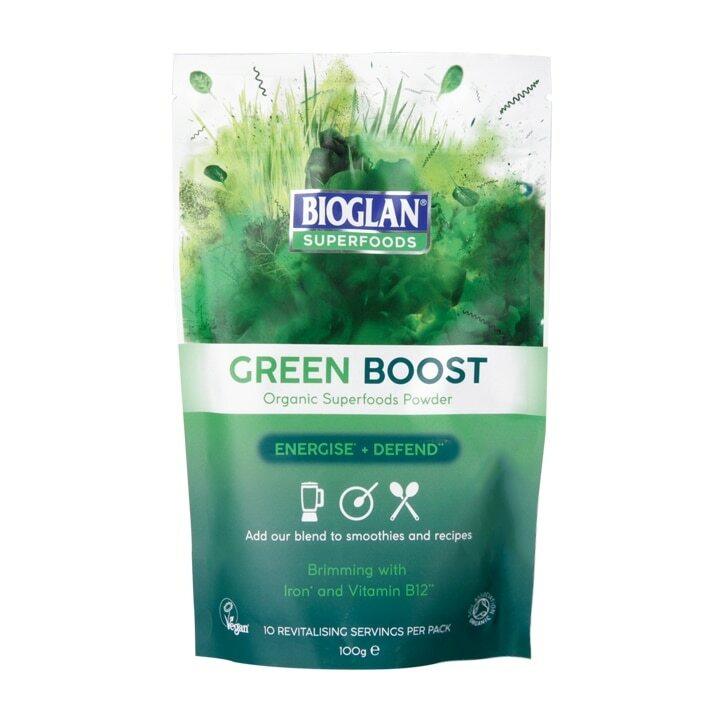 Bioglan Green Boost is packed with nutrient dense greens to provide the concentrated goodness found in green plants and vegetables in a convenient powder. It contains iron, which contributes to the reduction of tiredness and fatigue. A blend of barley grass, wheatgrass, spirulina, chlorella, spinach and kale, Green Boost has no added flavours so is perfet for using in both sweet and savoury dishes as well as adding to smoothies. Barleygrass powder (16.7%), Chlorella Powder (16.7%), Kale Powder (16.7%), Wheatgrass Powder (16.7%), Spirulina Powder (16.6%), Spinach Powder (16.6%). Bioglan Green Boost Powder is rated 4.1 out of 5 by 18. Rated 3 out of 5 by BM95 from Healthy but tastes gross I'm sure this is really good for you but it does taste horrible. Just one teaspoon will ruin a smoothie (and they suggest using two!) The back of the packet has a recipe for pesto so maybe I will try using this in savoury dishes instead. Rated 5 out of 5 by Michelle 63 from Give yourself a boost I bought this product as I am 53 and work full time as a carer. My hours are very often long and tiring and I felt I needed more energy. I just add Green Boost to foods and drinks for that super healthy kick.